Dementia can have numerous effects on a person emotionally, psychologically, and socially, since there are a number of practical impacts which can have both a physical and emotional impact on a person living with dementia. Many people describe having dementia as experiencing a series of losses and then adjusting to these losses. In many ways, this constant sense of loss and adjustment is challenging for the individual with dementia, so knowing how to best support a person living with dementia is extremely important if you are close to them or responsible for their care. That’s why we’ve collaborated with Fairfield Care, a care home supplier in the UK, to tackle the issues around understanding what it’s like to have dementia and thus how to support those who live with the disease. Better awareness and understanding of how dementia affects the way we think and feel and how this affects behaviour is the best way for you to improve and more effectively care for those with dementia, so that both they and the carer can get the best out of every day. Living with dementia is a very personal experience which will be different for each individual. Everybody has their own history, personality, and preferences, so their experience of dementia won’t be the same as another person’s. There are, however, some common effects of dementia: mainly memory difficulties and problems with thinking. These two symptoms lead to a whole host of other psychological and practical consequences. A person with dementia may suffer from a loss of self-esteem and confidence, for instance. It can also have an effect on their independence and relationships. As the condition progresses it can also effect a person’s ability to carry out everyday tasks such as cooking and cleaning, and their ability to carry out their favourite hobbies and pastimes. Despite these losses, it’s important to remember that even individuals living with extreme forms of dementia will still feel emotional connections to people and their environment, and will still retain some of their abilities. To learn more about what it’s like to live with dementia on the Alzheimer’s Society website. To care for someone with dementia, it’s important to know how the condition affects them personally. This means understanding how the person might think and feel. It’s also a big help to ensure a person with dementia feels included and valued. It’s also important to understand that a person with dementia might be experiencing the world very differently to those around them. Trying to see the world from the perspective of the person with dementia can help you offer support in a more helpful way. It can be difficult to do this, but the more you understand the person, the easier it becomes. Dementia can also have an impact on those supporting and caring for the person with the condition. It’s important for those caring for someone with dementia to also consider their own emotional needs. Carers of people with dementia may often be family coming to terms with the effects dementia is having on their loved one, and all will find themselves adapting to changing situations. A carer who is also a family member may benefit from outside support from a professional, and it’s a good idea to share the role of carer with someone else if possible. 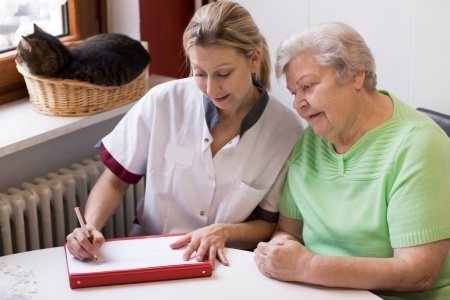 However, even if you are simply offering care as your primary role within a care home or privately visiting patients, you still need to take care of yourself, so that you can continue to take care of others. Caring for others can be very demanding, both physically and mentally and can cause stress as well as feelings of isolation or depression. Always make sure you seek help if you are finding parts of the role difficult or try to assess which aspects you struggle most with, and learn how to cope with them. We hope you found this information helpful and now have a better idea of what individuals living with dementia have to go deal with on a daily basis, in the hopes that now you are better equipped to care for your patient or loved one.